When should FPGA be chosen for a project in robotics? I'm not sure what in the linked question about development tools makes you think that they are not mature. It is true that most of them are proprietary and not open source. But I thought that the tools were quite mature even back when that question was asked three years ago. Today Xilinx, Altera, and Lattice all have freely available development environments that run on Windows and Linux with 32 and 64-bit support. If you insist on open source Icarus Verilog can do quite a bit. But I'd personally stick with the vendor specific tools. FPGA's are more than just a bunch of configurable flip flops. Consider the Altera NIOS II. A 32-bit soft-core processor capable of running Linux. Mix and match communications and other peripherals from OpenCores or from Xilinx, Altera, or Lattice and you've built a custom microcontroller with everything you need and nothing you don't. You can even write C code for the NIOS II processor and have certain functions implemented directly in the FPGA hardware if you need the speed. Is that high level enough thinking for you? FPGA's have a high initial investment cost. But it's cheaper and easier to add functionality later in the design process. That's what's meant by "forward looking" designs. Consider a project where you want to add some additional motors to your robot but you've run out of PWM generators on your microcontroller. What do you do? Add another microcontroller? Buy separate PWM chips and connect them to a communications interface? What if all your communications interfaces are in use? With an FPGA, this is reduced almost entirely to a copy and paste operation. It's a lot easier, cheaper, and quicker to scale a design to include new functionality without buying as much additional hardware with an FPGA. But probably the biggest reason to use an FPGA is speed. I'm not talking about pure clock speed. But when you need a lot of things to happen simultaneously. As Gossamer mentioned, parallelism is what FPGA's are really good at. Filter designs especially benefit from this kind of parallel architecture. If you need to filter and respond to a rapidly changing sensor, then you need an FPGA. They are also quite good at video processing as this too benefits from parallel processing. Take for instance this high-speed hand robot. It needs to process the video from the high-speed (1000 frames per second) machine vision camera as well as the tactile sensors and respond by manipulating numerous actuators in only a few milliseconds. This type of project is when you need to choose FPGAs. I think there might be a misconception around what an FPGA actually is and when it is used in designs. So let me try to explain that part first. At risk of simplication, an FPGA is little more than a processor that happens to be 'reconfigurable'. Why would someone want a 'reconfigurable' microprocessor? Well, because it costs far too much to fabricate a silicon processor to afford to do it for one, two, or even two hundred chips. You'd need to be running batches of thousands of chips to make it economically feasible. Since no design is ever bug-free the first time round, going the silicon route effectively commits a company to at least two if not more test runs, all at huge fabrication costs. Which essentially means that very few commercial companies are going to be interested in designing and bringing to fabrication anything other than chip with broad enough commercial appeal. So, if you come up with a brilliant design that justifies a custom microprocessor, then you might try to bring your idea to life on a shoestring budget by implementing it in an FPGA, where the actual chip is simply a collection of gates, and a 'program' (typically VHDL or Verilog) arranges those gates into an actual microprocessor. What you need for robotics is a processor. An FPGA is just a special kind of processor (reconfigurable). You ask whether you 'should'? Well that depends on your knowledge as well as where your real interests lie -- microprocessor design first or robotics first? If microprocessors are your passion, then by all means! And robotics is a great application area for custom microprocessors -- perhaps a vision cortex with many parallel decision pathways handled directly in hardware, or special tensor multiplication in hardware -- basically anything that generic processors can't handle well off-the-shelf. But if you're going to microprocessor designs in FPGAs, well, then of course you'll need to have all of that low level knowledge you mention, and more -- because fundamentally you'll be designing your own processor. Which has nothing really to do with robotics, even though your target application might be robotics. Most designers can probably find an existing processor that will do most of what they'll ever need. So I think you probably don't need an FPGA. First goal in my opinion is to try to get all of your creative concepts built up into a working robot (quite an intensive challenge in itself). If you find that you've got specific and significant processing bottlenecks in your design, then the next goal is optimising the selection / design of your processors, still commercially available chips. Maybe bigger, faster (trade-off with power draw, heat dissipation). Maybe smaller, dedicated chips handling specific tasks and interfacing with the main brain (trade-off with algorithm / logic complications). Only if there's capabilities that you just won't be able to get commercial chips to handle, then you might consider implementing a specialised processor inside an FPGA because at that point there will be very clear advantages that you hope to gain by 'rolling your own', and you can focus on just implementing those capabilities, with the right interfaces to rest of your design. Bottom line: FPGAs are a distraction from getting started in robotics --- until you're quite a ways down the robotics road -- and have gained some strong chops in digital electronics / microprocessor design somewhere along the way. Is there complex timing on I/O ports required? 3-Phase motor control can have such requirements. FPGAs have a slight advantage here. Can you parallelize your super low latency algorithm? Here the FPGA doesn't really compete with microcontrollers, but more with embedded PCs. Most things I would go for the embedded PC, but you may have an advantage with an FPGA for some specific applications. Dense stereo processing for example is often done in FPGAs. 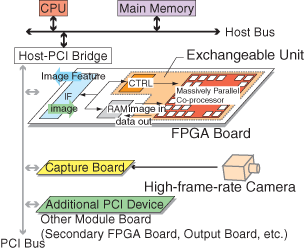 Lots of cameras use FPGAs for processing the data stream. What is also often used are hybrid solutions. Either with two chips, so one microcontroller for the program code, and an FPGA for IO or some other task. There also are a number of FPGAs that actually have a microcontroller embedded. I wouldn't be so harsh on FPGAs like some other posts, but would also generally argue, that unless you know your VHDL well, you will be better off using microcontroller, or even better still embedded PCs. Not the answer you're looking for? Browse other questions tagged design research logic-control or ask your own question.